Horse Association (NVRHA) was established in Colorado Springs, Colorado. Today, the association boasts members from Colorado, Iowa, Kansas, Minnesota, New Mexico and Wisconsin. The NVRHA offers five classes for competitors: ranch riding, ranch trail, ranch cutting, working ranch horse and ranch conformation. In addition to class awards and achievement awards based on points, the association annually names a top horse as their “Legend” horse, which is directly related to the association’s motto, “Ride the Legend.” The 150-plus members of NVRHA qualify to compete in the year-end championship by competing in a minimum of two shows during the year. According to NVRHA Vice-President Donna Stewart, riders range from those who have never shown before to seasoned horse-show veterans looking for a change. “We offer a relaxed environment to enjoy horses with friends,” Stewart says. “Our association is a great place to start a young horse out—low pressure, safe environment, focus on education and ‘doing things right.’ ”Stewart says this year may hold some changes for the association. While there was a Youth division in NVRHA early on, the numbers dropped to the point where the youth were mixed into the other divisions. However, a recent uptick in young riders has the association looking to reinstate the Youth category. In addition, the association is in talks with groups in Alabama, Nebraska and Wyoming to add affiliate shows. In 2016, 32 competitors vied for titles at the September 24-26, championship show that caps off the year. Open Champion Lavert Avent, Elbert, Colorado, rode away with the title World’s Greatest Ranch Horse on Metallic Gun, owned by G.M. and Joyce Ann Jones. Avent originally joined NVRHA to improve as a competitor before trying his hand in reined cow horse shows. However, he kept returning because of the challenge of competing in multiple events. “It was a stepping stone to get my feet wet in the show pen and get more seasoned to go down the fence,” he says. “It just took off from there. I like it. It is really hard to get a horse seasoned for five or six events. The cow classes are [this horse’s] real deal; I can always depend on him.” Lavert Avent started riding G.M. and Joyce Ann Jones’ stallion Metallic gun only a year ago. 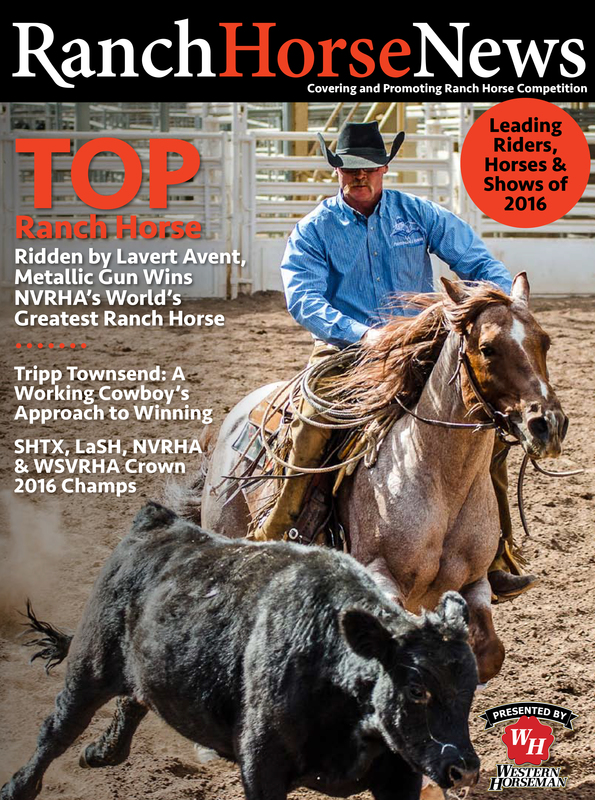 the two topped the open division to win the NVRHA’s World’s greatest ranch horse championship. Saturday clinic/Sunday show weekend events. Having clinicians like Avent who know what it is like to show in versatility and can offer sound advice is one of the reasons that Limited Amateur Champion Richard Cook enjoys showing in NVRHA. Cook rode his homebred 10-year-old Paint mare, Real To Reel, to the title.“I’ve been doing this for about 8 years and kind of toying with it, but nothing serious,” Cook says. “I’ve had fun and made friends, but this past year I decided to get serious about it. I went to more clinics and trainers to see what [the judges] wanted to see, studied the classes and rode harder to be better at it.”Cook’s dedication paid off with a win. He may have achieved one goal, but Cook has no intention of slacking off. He says that 2017 will find him showing in Amateur and riding a younger horse. For him, the friendships and quality of horses bring him back show after show.